Booktree and Open Books help uphold a Pacific Northwest tradition. It’s a sentiment that resonates with Mary Harris, former co-owner of Parkplace Books (which closed in December). Last week, with co-owner Christopher Jarmick, she opened a new store in Kirkland: Booktree, named for the fanciful wooden sculpture of a tree — complete with shelving space for books — that once graced the children’s room at Parkplace. The shop, with the tree having pride of place by the front window, is now one of the Eastside’s only single independent bookstores (along with Island Books on Mercer Island). Open daily, 609 Market St., Kirkland (425-202-7791 or booktreekirkland.com). Open Tuesdays-Sundays, 2414 N. 45th St., Seattle (206-633-0811 or openpoetrybooks.com). And, increasingly, independent bookstores are thriving: The American Booksellers Association (ABA) reported this year that its membership has grown for the seventh consecutive year. Though Amazon.com and chain bookstores (remember when Borders was a thing?) initially seemed to pose a threat to brick-and-mortar indies, customers are newly yearning for that gathering place Harris mentions. This year, the ABA reports the number of locations for independently owned bookstores has grown to 2,311, up from 2,227 in 2015 and just 1,651 in 2009. The Pacific Northwest has long been blessed with a robust collection of independent bookstores — and with bookstore owners determined to continue traditions. Harris was herself a longtime employee at Parkplace Books before buying it, with Rebecca Willow, in 2002. Unlike Harris, Swift is a novice at what she described as “the remarkably Byzantine ins and outs of ordering and distribution.” But she’s learning quickly, after seeking advice from other independent bookstore owners and attending their meetings (“It was like being in a room full of my superheroes”). 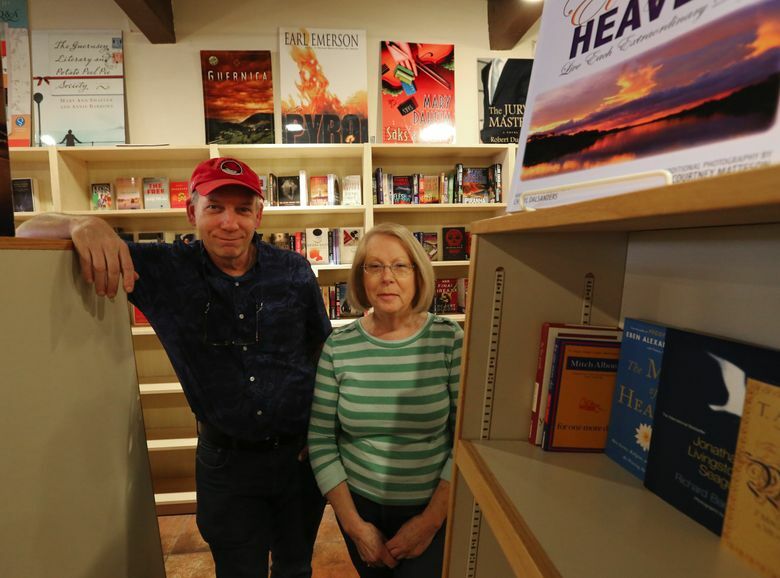 The store, which stocks about 10,000 new and used poetry titles, had a grand reopening in September after several weeks’ closure. Swift hopes to continue in the tradition of previous owners John Marshall and Christine Deavel in making Open Books a meeting place for Seattle’s poetry community, hosting readings and events at the store (including weekly “Winnie the Pooh” story hours) and reaching out beyond its walls. Likewise, Harris and Jarmick look forward to hosting events at their cozy Booktree space. (The bookshelves are all on casters and can be rolled back to make room for rows of chairs for readings.) They’ll be stocking about 20,000 titles, with an emphasis on new fiction, books for children and teens and on book-club service. They have been thrilled to see strong community support, even before their doors opened earlier this month. Harris said that 150 to 200 people have helped make Booktree a reality, many of whom were former Parkplace Books customers who wrote checks to help the new business get started. “I think we will open the business with positive cash flow,” said Jarmick, gratitude evident in his voice. Information in this story has been corrected, after an original misstatement about the number of independent bookstores on the Eastside. Book editor Mary Ann Gwinn is on leave until Thanksgiving. Moira Macdonald: 206-464-2725 or mmacdonald@seattletimes.com. On Twitter @moiraverse.